Develop your customer following and relationships with Equifest's loyal community of over 10,000 passionate horse enthusiasts and competitors, who want to learn, buy, compete and have fun! We tailor all of our sponsorship packages to deliver against your set objectives and budgets. Working closely with our sponsors, we ensure the return on their investment is maximised. 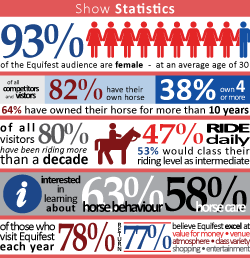 With different levels of sponsorship options available at Equifest, your involvement is only limited by the imagination. Please visit Sponsorship Opportunities to find out more. For more info on Corporate Sponsorship, please contact Jenny Needham. Founded in 2008, Equifest has established itself as the unmissable 4-day festival of fun and enjoyment for all horse lovers. 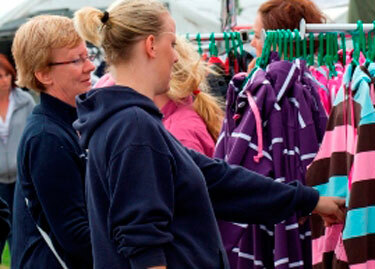 Held every August at the East of England Arena and Events Centre, the show has grown significantly and now attracts over 10,000 visitors and competitors from all over the UK. It is now regarded as one of the largest competing amateur events in the country. Equifest has an avid and loyal following, with over 1,500 horses stable on site, 2,500 horses catalogued, which produces over 12,500 entries into a variety of disciplines – including Showing, Show Jumping, Dressage, Carriage Driving and Hackney Horses. Additional activity includes a full schedule of spectacular day and evening entertainment, shop-till-you-drop retail lines. Equifest has earned its place in the UK’s annual equestrian calendar, as one of the rider’s favourite shows of the year, with an audience that are committed, hands-on and experienced horse owners, devoted to their equestrian lifestyle. The majority are female, with an average age of 30 years. They ride daily, or at least a few times a week, and mainly keep their horses at home or in DIY livery. There is an eagerness to invest in products and services that will help advance their riding ability and keep their horses healthy. Riding and owning horses isn’t a hobby to the Equifest visitor – it’s a lifestyle!